Hello, folks! There was a mention on this forum about XOD long-long time ago and I decided to update the state. 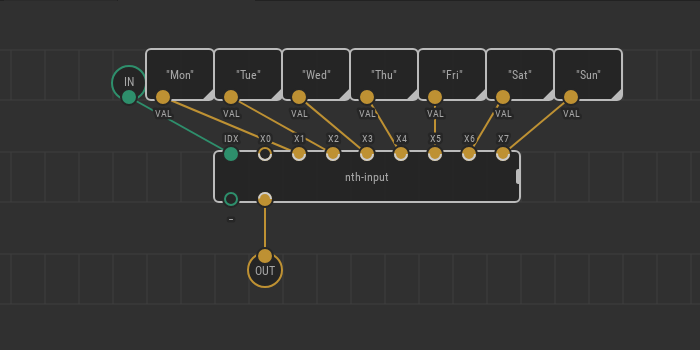 We are making a free and open source visual programming language for Arduino. It is called XOD (https://xod.io). It does not pretend to replace Arduino's C++ neither it is a Scratch alternative. You might find XOD useful if you're making your first steps in DIY-electronics, for quick prototyping, or STEM education applications. The platform is not locked to a particular vendor or hardware. Anyone can create and publish new nodes (building blocks) to support new functions and hardware. You are welcome to try and participate. We just released a new version of XOD: 0.25.0. Now you can upload directly to boards built around the ESP8266 chip and other boards which are supported by the original Arduino IDE. Not so long time ago we reported that XOD is compatible with ESP8266 modules to access internet resources. However, the only way to use ESP8266 was the AT-commands slave mode. You had to use an Arduino as the primary board anyway. Nonetheless, ESP8266 is a powerful chip which can easily act on its own without any assistance from another MCU. There are boards on the market entirely built around ESP8266; the popular examples are WEMOS and NodeMCU. The new 0.25.0 release of XOD brings all necessary changes to make it possible for compiling and uploading to ESP8266-based boards natively right from within IDE. Of course, an ESP8266 board without internet access is weird. So, XOD now carries a new library xod-dev/esp8266-mcu. The nodes inside it are very similar to those available for the AT-mode, but they work with the built-in Wi-Fi. XOD 0.26.0 is here. We made an effort to bring a unit testing framework to the system. Something that the conventional Arduino IDE is missing. Check out the release announcement for details. To record informal records of expenses, IOUs, and payments. " XOD 0.28.0 is here. The patch board (main "coding" area) became more detailed and friendly. Read the full release notes in the blog article. Meet reworked XOD tutorial with the release 0.29.0. Those who have no hardware yet can start playing using the simulation mode: the first part of the tutorial does not require it.